I am very grateful to all of you for reading my blog over the past year. It’s one thing for a writer to write — that’s mere self-expression; it’s entirely different when people actually read it, too — that makes it communication. Your writing comments on the blog is the real icing on the cake — that makes the communication two-way. In 2010, there were 144 new posts, growing the total archive of this blog to 311 posts. There were 275 pictures uploaded, taking up a total of 46mb. That’s about 5 pictures per week. The busiest day of the year was March 18th with 186 views. 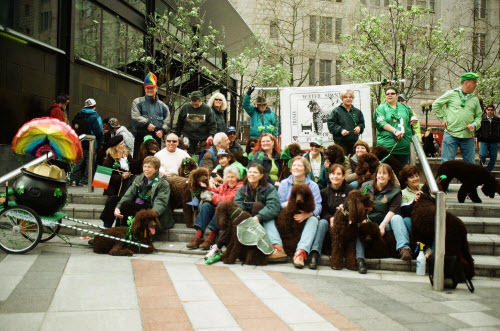 The most popular post that day was St. Patrick’s Day Parade — Seattle. The top referring sites in 2010 were facebook.com, mail.yahoo.com, pets.groups.yahoo.com, mail.live.com, and retrieverman.wordpress.com. Some visitors came searching, mostly for the cooper project, cooper project, dog family tree, project cooper, and cooper project iws.